This guy here is a professional busker (i.e. street performer). 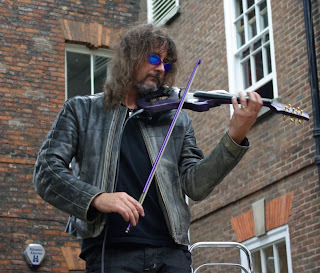 I've seen him perform several times with his hand-crafted electric violin in York, and he never fails to amaze. He's so famous he's got his own Wikipedia entry. Hahaha. This video was taken a few days ago when we were in town grocery shopping for ingredients to make cucur pisang. Fact. Ed Alleyne-Johnson does the most amazing covers of famous songs like 'The Zephyr Song,' 'Sweet Child Of Mine' and even the theme for the Simpsons. Just look up his name on youtube. He's quite a youtube sensation.